Enduring Mother Nature's temper tantrums is the price we pay for enjoying her majestic splendor. As some areas of the country enter the stormy season, while others are on alert for tornadoes and hurricanes, it's a good time to ask yourself how prepared your household is for the possible aftermath of extreme weather. The best time to deal with an emergency is before it happens. Here is a checklist for building an emergency preparedness kit along with some practical safety tips to get through a tornado or hurricane. After a natural disaster, it can take several days before services are restored. 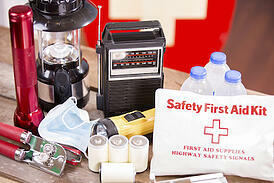 You should plan on a minimum of three days' worth of supplies while building your emergency kit. Here are essential items that should be included. Other items to consider are extra clothing and footwear and camping equipment. If you have a pet, don't forget to pack food and water for him as well. At our Springs Apartments communities, resident safety is our main concern. Our team is happy to assist you with any questions you may have about emergency preparedness. You may also visit Ready.gov for additional preparedness tips and advice.